March courses begin on February 11, when instructors email the syllabus The focus weekend takes place March 9-10, and final assignments are due April 12 (if you take the class for credit). If you would like to audit a course, the tuition is $100. If you would like to take the class for credit, the tuition is $180. The cos﻿﻿﻿t (whether you audit or take for credit) includes ﻿﻿﻿meals and overnight accommodations at Upton Hall on Friday and Saturday night (on a space-available basis). If you wish to take the class for credit, we encourage you to enroll by February 12. However, if you wish to audit the class, you may register at any time prior to the focus weekend. This course addresses the basic principles of sacramental theology from a classical Anglican standpoint and the historical development of the Book of Common Prayer as a response to those principles. Beginning with the fundamental categories of time, space, and incarnation, this course provides a biblical and theological base for the further study and practice of the liturgical worship in the Episcopal tradition. McCabe, Herbert. The New Creation. Bloomsbury Academic, 2010. This course will apply concepts learned in Social Ministry I to the participant’s particular local context. Students will develop ministry partnerships within their own local community and will learn basic community organizing principles such as asset mapping. This course will use, in part, the Called to Transformation model of Asset Based Community Development developed by the Episcopal Church and Episcopal Relief & Development. McNight, John and Block, Peter. The Abundant Community: Awakening the Power of Families and Neighborhoods, 2012. 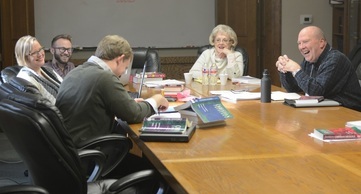 This class provides an overview of parish administration and offers students the basic resources you need to navigate administration in a parish and ministry setting, primarily from the standpoint of a volunteer-based church. Topics include how to identity a team, team process, and how to implement the structures and checks and balances necessary to have a good system in a church. Class sessions will cover reading material and then use a case study for discussion. You may see some parallels to your own congregation or a congregation you might serve in the future! Church Pension Group. Model Policies for the Protection of Children and Youth from Abuse. New York: Church Pension Group, 2004. Cladis, George. Leading the Team Based Church: How Pastors and Church Staffs Can Grow Together into a Powerful Fellowship of Leaders. San Francisco: Jossey- Bass, 1999. Mallory, Sue. The Equipping Church: Serving Together to Transform Lives. Grand Rapids: Zondervan, 2001. The Episcopal Church. Manual of Business Methods in Church Affairs. New York: Domestic and Foreign Missionary Society of the Protestant Episcopal Church, 2009 . The Episcopal Church Foundation. The Vestry Resource Guide, 3rd Ed. New York: Forward Movement Publications, 2010. Powers, Bruce P. Church Administration Handbook. B & H Publishing, 2008 3rd edition. The Rev. Gar Demo came to St. Thomas the Apostle, Overland Park, KS, in 2006 from St. Peter’s in Conway, Arkansas where he was Vicar From 1998-2002, he was the assistant rector at St. Michael and All Angels in Mission, Kansas, before which he spent a year at St. Margaret’s in Lawrence, Kansas and as the youth coordinator for the Diocese of Kansas. Demo attended the Episcopal Theological Seminary of the Southwest (ETSS) in Austin, Texas after receiving his BA in Psychology with a minor in Music from Wichita State University in 1994. He was ordained in 1997 and entered the priesthood in Dec. 1997. Demo also earned his MBA from Friends University in 2010.